The Kingpin is BACK with another EPIC list for you all and this one is for shade and coverage "on the cheap"! Several of you loyal Canopy Kingpin readers may ask, "Kingpin, are there any cheaper shade and coverage alternatives to the average party tent?" The Kingpin is aware that canopy products aren't for everybody. They are financial investments on your home and if you want something good, chances are you're gonna pay for it. Fortunately, this is NOT always the case! 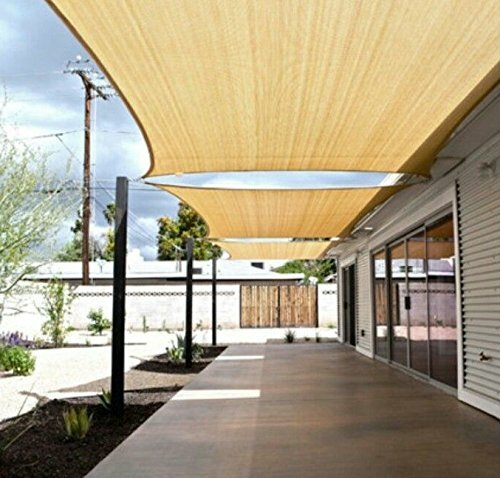 Shade sail products are a great alternative to your run-of-the-mill canopy installation. 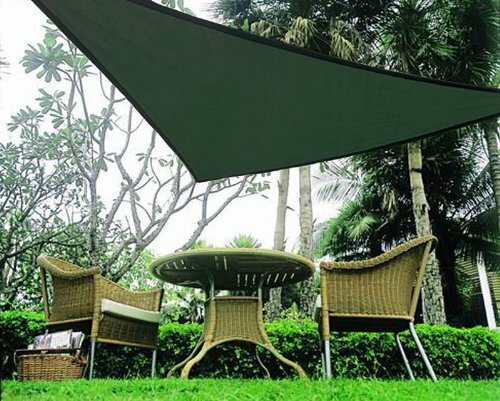 They may not be applicable in all outdoor situations, but if you are looking for something durable AND affordable to beat the heat with in your backyard, a shade sail or two may be just the thing. Last update on 2019-04-25 at 19:07 Product prices and availability are accurate as of the date/time indicated and are subject to change. Any price and availability information displayed on [relevant Amazon Site(s), as applicable] at the time of purchase will apply to the purchase of this product. One thing is for sure though, shade sails look awesome. That at the very least is super obvious. Look at these product photos! This lush, forest green model will look great in any backyard. So, what is a shade sail exactly? 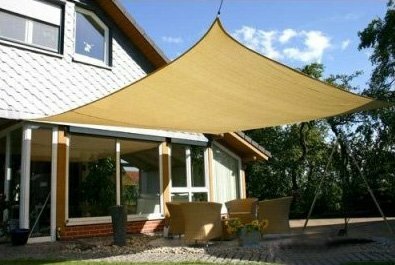 Shade sails are outdoor shade products developed from sail technology. The "sail" itself is tautly suspended from several anchor points and the result is a cool looking canopy that looks very similar to a ship's sail! ARRRRR Maytey! As sleek and futuristic as they may look, this technology has actually been around since the time of Roman gladiators and ancient Egypt. According to the Wikipedia entry, Romans pulled several large canvas sails into place in order to shade the great Colosseum. This was presumably executed by their best Roman sailors, due to their familiarity with ship sails. God bless the Romans! This 20' x 20' model includes a carrying bag and will beautify any backyard porch, deck or patio in a jiffy! 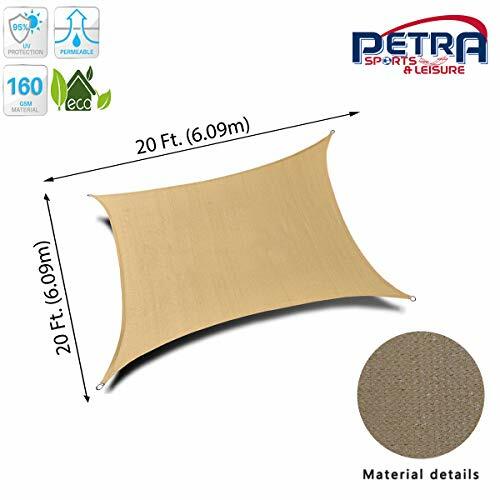 Shade sails come in several different colors and sizes and as long as you take some good measurement before hand, you will certainly find a size that will fit your needs specifically. Pretty much all of the models featured on this list come with sturdy D-rings and nylon roping for easy and secure setup. There's no pooling water and rain will pass right through so it's really just a matter of setting it up with the nylon chords and you're good to go. TIP: It's important to make sure that you have a good spot to fix your sail onto, whether its an adjacent wall, tree or porch/patio column. These two shade sails come as a pair! Both of them are made in a stunning 11.5' triangular design and will look great set up in your home. You can adjust the sails to target the areas that need shade the most. Another great thing about shade sails is how wonderfully they lend to creative installation! Take two and install them overlapping each other or spaced adjacent at different elevations. These will both produce an artistic, stylish facade for your home that your friends will love. You can also use them to cover pretty much anything thanks to their size and ease of use. Use them to shade windows, garages, doghouses or even that plastic kiddie fort in the back that's always getting too hot for junior and his buddies. This﻿﻿ lovely 12' x 8'﻿﻿ offering from San Diego is just right for most patio areas. Little Cujo over there seems to agree! Shade sails are constructed from breathable, polyethylene fabric and this maximizes the cooling effect on the desired area. This material lets both wind and water pass through and that makes these products extremely strong against most types of exposure to the elements. Whether you live in the desert heat or up in a sunny mountain area, shade sails will always be ready to provide you with sufficient protection and comfort from the sun. This 11 x 5 model comes complete with a stainless steel hardware kit for easy installation. This includes 4 turnbuckles, 4 snap hooks and 4 eyepads, which is actually a great value all on its own--for free! The breathable fabric blocks the sun out so significantly that you can even use it to save energy at home. Install one out by a window to keep the airflow cool as it obliterates heat and harmful UV rays. Picking one with the right color to match your home and good installation spot will quickly improve and beautify your home facade. Just make sure you dig the design as well! The fabric on the Coolaroo model pictured above is covered by a 10 year warranty against UV damage and degradation. are made out of polyethylene and this is one of the best things about them. Polyethylene naturally resists mildew, mold and staining and has an incredible longevity in general. It doesn't crack easily or start fading on you prematurely and you can expect each of your shade sails to provide you with reliable protection in any climate for many years to come. Installing new shade sails is something you can accomplish on a lazy afternoon and a bottle of whisky! At least, that’s how the Kingpin does his yard work. Just examine your yard and see if there are any obvious support beams available, like wooden posts or trees. If nothing really catches your eye, you can even use the walls along your patio or perhaps steel columns embedded into a concrete base. Needless to say, this last option would require some creative landscaping and you had better be committed to the installation! Not all homes will need a permanent installation and shade sails are actually quite portable in general. Most of the models featured on this list come with carrying bags right out of the box. They are easily detachable and can be taken down when the seasons change or even to fit your mood. Washing them is also very easy to do and all you really need is soap and water! Another 20' x 16' model from MTN OutdoorGear but this time in a stylish beige. It's made with extra heavy UV stabilized fabric and it looks great against the cool, crystal-clear blue water. 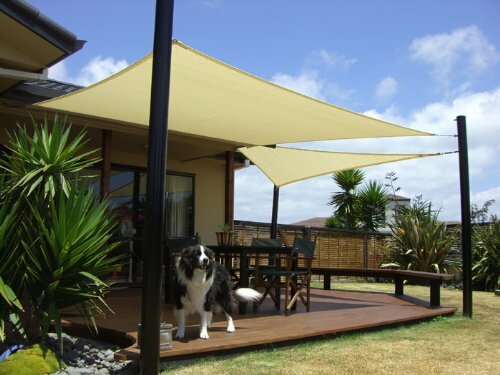 These products will block out up to 90% of UV rays for any covered area. That's perfect for your swimming pool! Finally, a chance to get wet without all the mucky sunscreen. In some cases, less is more! This 16' x 5' offering from Idirec﻿tmart is made with a high density polyethylene weave fabirc and is beautifully displayed above a small wicker patio set in the photo above. Even a small intimate area can benefit from a new shade sail installation. You will know that you've installed your brand new shade sail properly once it comes up off the ground, as the sail fabric should not be wrinkling, sagging or flapping with the wind. If this is not the case, tension that sucker up! This tan square sail is a massive 18' x 18' and will perfectly cover a large area quite easily. 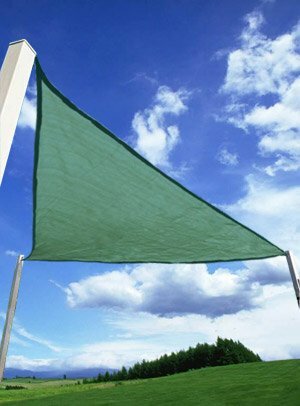 The UV protection shade sails naturally provide is quickly taken for granted these days, as there are several UV related products on the market. Some of you may not know though that skin cancer is quickly becoming the fastest growing cancer in the United States. A well-placed sail could save you and your family from hours upon hours of unregulated exposure. Take a look at your backyard and think about where you and your kids spend the most time--that may be a perfect place for a brand new shade sail. This pic is a great example of the good these products can do for your home and family. Coolaroo can outfit you with this 9 feet and 10 inch triangle party sail. The royal blue evokes a pleasant cool hue wherever you want it to and your little darling's sandbox and swing may be just the place. 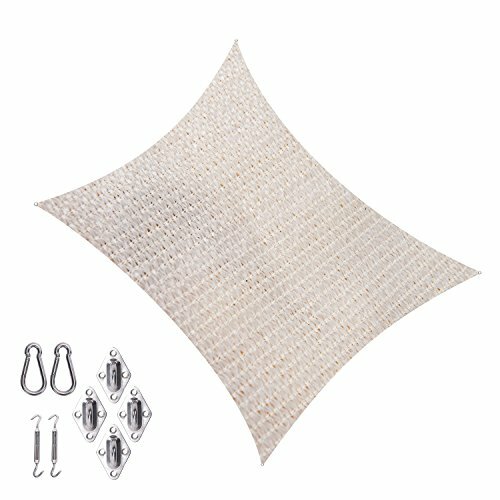 Coolaroo's party sail line is designed for quick and easy installation and take down. 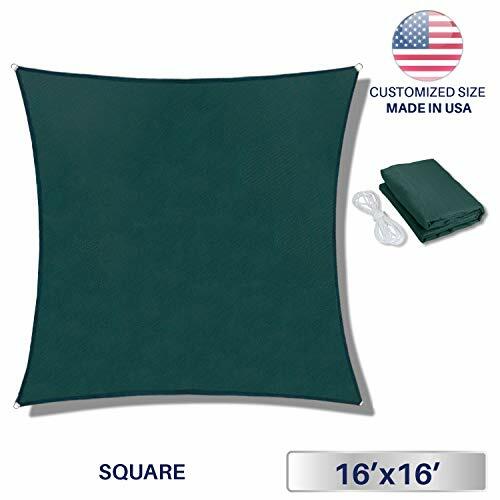 Designed for use almost anywhere, you can even bring this junior shade sail along to your neighbor's next BBQ and set up a nice cool drink station across from the grill! It's perfects for all kinds of events like picnics, BBQs, reunions, children's play-dates and more. Our last item is another great example of creative sail installation. 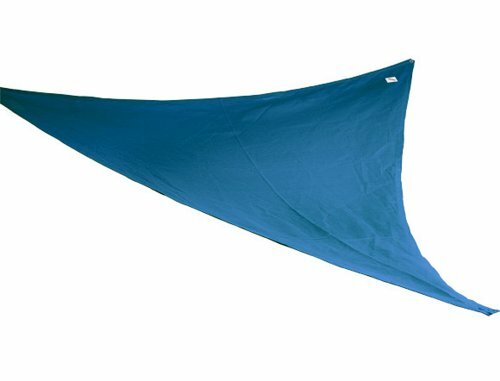 Who would have thunk to place one of these beautiful shade sails over your gardening plot? No more sunburn on the back of your neck! You can finally dress appropriately for the heat and tend to your tulips without all the heat. Then quickly remove the shade sail to give your lovelies all the wonderful, photosynthesis-inducing sunlight they need. The applications of these products is really only limited by the imagination! What kind of EPIC list would this be with out a few informative shade sail installation videos? At the very least, the Kingpin thought these could give you some inspiration for where and how you will use a brand new sail in your own patio or backyard. Check these out and grab one for yourself today! Home improvement, especially in the canopy coverage department, doesn't have to break the bank. 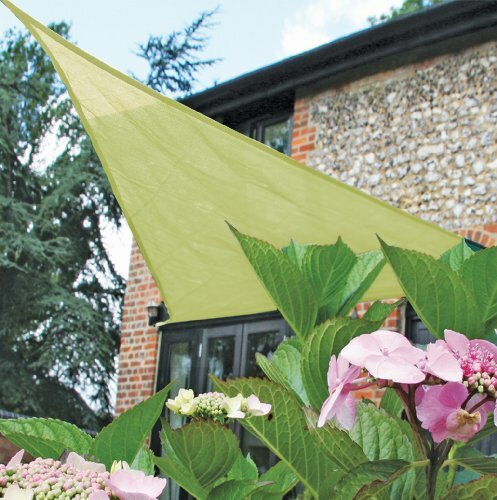 Shades sails provide you with a cheaper alternative to regular canopy products and they are not only super easy to install, but are extremely stylish as well. At the end of the day, the money you spend for a brand new shade sail is a small price to pay for a beautiful protective shade product that will stand the test of time and provide you with a multitude of installation options. Take your pick of the shade sails above and click through the pics to grab the one you like! Come on in out of the sun! Keep your cool with CanopyKingpin.com!